4120 Willowhead Way, Naples, FL.| MLS# 219010984 | Bonita Springs, Estero, Naples, Fort Myers Beach FL Real Estate | Marie Pimm PA Realtor. Representing U.S. and International Buyers and Sellers in the purchase and sale of investment or personal property. Marie is a skilled 1031 Exchange Realtor. 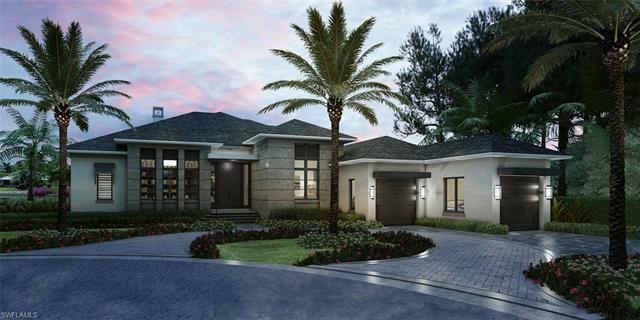 This brand new custom estate is being built by Toscana Homes and is situated with impressive water views and will be built with sleek elements that will make this a sought-after gem in the Naples area. Rooms are spacious, and include 4 full bedrooms, 4 full bathrooms and two half baths, all spread over almost 4, 000 square feet under air and 5, 500 square feet total. Upgrades and other room notables will be only fitting for a home of this magnitude, and include a dramatic double-door entry, detailed crown moldings, and additional decorative features, wood coffered and tray ceilings for added appeal, gourmet kitchen with fine modern appliances and custom cabinetry, custom tile and wood flooring, pocket sliding doors that help bring the outdoor beauty in and much more. The lanai is a true retreat, with a spectacular pool and spa with a sun shelf and water features, a outdoor kitchen, and a fire pit with a large seating area overlooking the lake. This home is within walking distance to Venetian Village and Park Shore offers a private beach association. Please contact for more info, completion date set for year end.